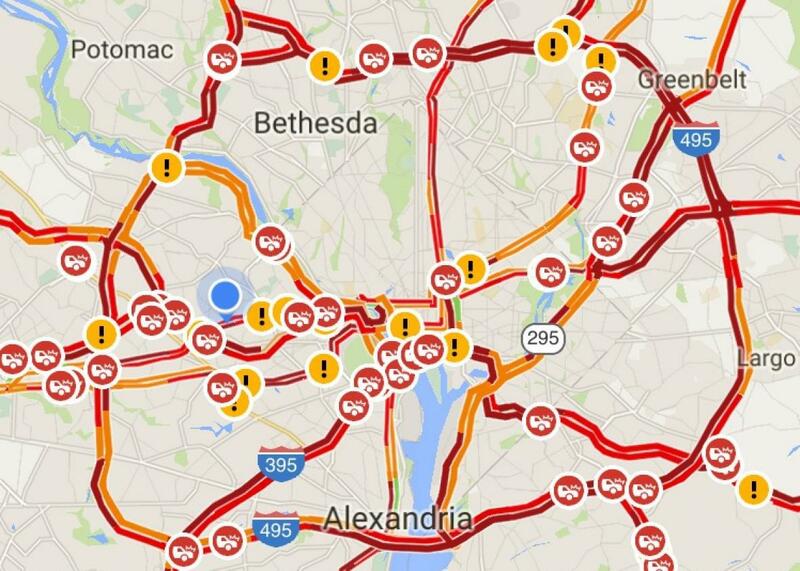 Snowlock in D.C.: Traffic nightmare in the Washington area. D.C. traffic at 8:45 p.m. Wednesday. With the entire Northeastern coast looking ahead to this weekend’s monster snowstorm, the D.C. area was caught by surprise Wednesday night by a rush-hour squall that created a traffic nightmare across the region. Every major highway and thoroughfare in the area was backed up for hours and delays lasted into the early morning hours Thursday. Laugh all you want about D.C. drivers—and I did, never fear!—but Wednesday’s “snowlock,” as Twitter users started calling it, was made possible in great measure by the fact that very few roads in the area had been pre-treated by state and local crews. According to the Washington Post, Maryland state crews did not pre-treat because the forecast was only for flurries; Virginia didn’t for fear that subfreezing temperatures would freeze the pre-treatment, making conditions worse. Officials in Arlington, Virginia, my city, say they began pre-treating Wednesday afternoon; few drivers saw any results Wednesday night as they slipped and slid across the county. I live on a busy boulevard in Arlington, and my street received its first coating of salt at 8:40—Thursday morning. Things aren’t much better the day after the squall; many roads are icy, and accidents continue to pile up. If you’re driving around D.C. Thursday, drive very slowly, exercise caution on hills, and above all don’t skid out, careen across my lawn, and hit my car while it’s parked IN MY DRIVEWAY. Oops, too late!